inteliCharts Platform allows individual, professional and institutional investors to access stock market data in the form of financial charts. inteliCharts engine automatically downloads requested data and stores it in a local SQL database. Once stored in the database, the stock data can be retrieved instantaneously even if access to the internet is not available. This document describes all the features of inteliCharts with examples of how to use them. Most of inteliCharts features are available to everyone as most of the features are part of inteliCharts Free edition. Some of the more advanced features are only available in Professional edition of inteliCharts. It is important to note that all technical indicators and overlays are available free of charge to all users. Some advanced indicator parameter modifications may be reserved for Professional edition users. All users have access to historical daily data, custom layouts, advanced drawing tools, ability to save custom layouts with all lines created. Some features of advanced drawing tools are only available in Professional edition of inteliCharts. Once downloaded and installed inteliCharts icon can be found on your desktop, and in the Start menu. Clicking on the icon starts the program by first checking for updates. If a new version of inteliCharts is found you will be prompted to install the update. It is recommended to always install the newest version of inteliCharts since it contains program improvements and enhancements. 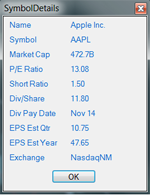 Ticker symbol is entered in the text box located in the top left corner of the main chart control window. If you have multiple charts open the new ticker will be applied to the last active chart. The last active chart is the chart contained in the last active window. The last active chart can also be identified by bold ticker description in the top left part of the chart. Once you enter the ticker in the text box you can either press Enter or press the GO button located right next to the ticker text box. Each bar on a chart represents a unit of time called interval. You can change the interval in three different ways. • From the main chart control window select Chart, expand Interval from the dropdown menu and then select available unit of time. • Select any one of available interval symbol buttons located right next to the"GO" button. • Right-click anywhere on the chart and select Interval from the dropdown menu. You can create as many charts as you wish. New charts can represent the same ticker or can be for a different stock or index. Creating a new chart window can be accomplished in two ways, either by selecting "New Chart" from the "File" dropdown menu or by clicking the "New Chart" button in the main control window. You can save the current layout in the default location at any time by expanding the "File" menu and selecting "Save Layout" from the dropdown menu. Save Layout option saves all of the open charts' ticker information, bar spacing, style, colors, all studies and all drawings. All of the windows locations, states and sizes are saved as well. Optionally you can right click anywhere on the chart and select "Save Layout" option from the dropdown menu. "Save Layout As" allows you to save the current layout by specifying the layout file name. You can do that by expanding the "File" menu and selecting "Save Layout As" from the dropdown menu. Save Layout As option saves all of the open charts ticker information, bar spacing, style, colors, all studies and all drawings. All of the windows locations and sizes are saved as well. Optionally you can right click anywhere on the chart and select "Save Layout As" option from the dropdown menu. Any saved layout can be loaded by selecting "Load Layout" from the "File" menu. Loading a previously saved layout automatically closes the current layout including all of the open chart windows. Before the open layout dialog appears you will be prompted if you wish to save the current layout. If you select "No" all current chart windows will close without saving any changes you may have made to the charts. "Load Layout" restores previously saved layout with all of the chart windows in the same saved location and state. Load Layout restores previously saved chart ticker information, bar spacing, style, colors, all studies and all drawings. Selecting "Close Layout" from the "File" dropdown menu closes all the chart windows resulting in an empty workspace. Before the current layout closes you will be prompted if you wish to save the current layout. If you select "No" all current chart windows will close without saving any changes you may have made to the charts. Selecting "Save Lines" from the "File" dropdown menu opens up a save file dialog where you can select a file name from the list of files or create a new file. Lines that are going to be saved with this method are all the lines that belong to the active chart with all of their properties and ticker assignments. You can also save all the lines from the active chart by right-clicking anywhere on the chart and selecting "Save Lines" from the dropdown menu. Previously saved chart lines can be loaded into the active chart by selecting "Load Lines" from the "File" dropdown menu. Every line has its own stored properties and ticker assignment. These properties will be restored when the lines are loaded and all the lines will be assigned to their previously stored respective tickers. Stored lines can also be loaded by right clicking anywhere on the chart and selecting "Load Lines" from the dropdown menu. Char's price scale can be set to either linear or logarithmic. To change the chart's price scale expand the "Chart" menu and select "Chart Scale" from the dropdown. There are two available selections: "Log" and "Linear", a check mark next to one indicates the type of scale currently selected. You can also use "Ln" and "Lg" buttons located in the main controls window to set the scale to linear and logarithmic respectively or right-click anywhere on the chart and select "Price Scale" from the dropdown menu. or right-click anywhere on the chart and select "Price Range" from the dropdown menu. or right-click anywhere on the chart and select "Bar Spacing" from the dropdown menu. or right click anywhere on the chart and select "Bar Thickness" from the dropdown menu. To change color properties of the active chart expand "Chart" in main control window and select "Colors..." from the dropdown menu. You can also select colors by right-clicking anywhere on the chart and selecting "Colors..." from the dropdown menu. Once Color Setting window opens you can change the color of the following chart properties: Background, Axes Background, Price Bars, Crosshairs, Axes Labels, Info Tape, Info Box, Main Info, Selected Bar and Axis Border. You can copy one chart's properties to another by expanding " Style" from the "Chart" dropdown menu and selecting "Copy Style" . By selecting "Copy Style" all of the currently active chart's colors and properties are copied and can be pasted to another chart making that chart look and feel exactly the same as the chart being copied. To apply copied style to another chart use "Paste Style" available in the same dropdown as "Copy Style". Both "Copy Style" and "Paste Style" are also available by right-clicking anywhere on the chart and selecting "Style" from the dropdown menu. Previously copied chart styles can be applied to another chart by expanding " Style" from the "Chart" dropdown menu and selecting "Paste Style" . Both "Copy Style" and "Paste Style" are also available by right-clicking anywhere on the chart and selecting "Style" from the dropdown menu. inteliCharts comes with predefined styles that can be applied to any chart by expanding " Style" from the "Chart" dropdown menu and selecting "Paste Default". This feature can also be accessed by right-clicking anywhere on the chart, expanding "Style" and selecting "Paste Default". Snapshot Info Tape contains the most recent bar's information: Last Date, Last Trade Time, Percentage Change, Change, Open, High and Low. To hide the Tape select "Options" and uncheck "Snapshot Tape" from the dropdown menu. The same can be accomplished by right-clicking anywhere on the chart and placing or removing a checkmark next to "Snapshot Tape". To change the location of the information tape hover over it with the mouse pointer, click and drag the tape to your desired location. Tracking Window displays information related to the currently selected price bar. The displayed items are: date, open, high, low, close, volume, total number of all bars, currently selected bar index, crosshairs y-value and any indicator or overlay values. The x-axis time value is synchronized across all the charts if multiple chart windows are opened. To hide the tracking window select "Options" and uncheck "Tracking Window" from the dropdown menu. The same can be accomplished by right-clicking anywhere on the chart and placing or removing a checkmark next to "Tracking Window". To change the location of the tracking window hover over it with the mouse pointer, click and drag the tracking window to your desired location. Underlying stock or index information can be accessed by expanding "Options" and selecting "Symbol Details" from the dropdown menu. The stock information is displayed in a separate window and contains: company name, market cap, P/E ratio, short ratio, dividend per share, dividend pay date, EPS estimate quarter, EPS estimate year and the name of the exchange the security is listed on. If for some reason the stock price data is not properly reflected on the chart you can delete all the price data for the stock from the database and reload all the stock price data again. In order to reload the stock data expand "Options" located in main control window and select "Reload Data" from the dropdown menu. Stock and index prices are updated automatically for all of the stocks in currently open charts. To increase update frequency expand "Options" located in the main control window and select "Data Feed" from the dropdown menu. You can also press the button with the letter "F" in the middle to increase stock data update rate. There is three different types of lines available with inteliCharts. Extended line type infinitely extends both ends of the line. Ray line type has one end and the other end is infinitely extended. Segment line type keeps both ends exactly as drawn. To select the line drawing tool expand "Tools" in the main control window or right click anywhere on the chart and select desired line tool from the drop down menu. You can also select any line tool by pressing one of the line buttons located in the main control window. To draw a line start by placing the first point by left-clicking the mouse at the desired location. You do not have to hold the left mouse button down while you are dragging the other end of the line. If the line magnet feature is active and you are placing the line at the top or bottom of the price bar the line end you are placing will automatically "stick" to the price bar when the line is close to the bar. To deselect the line tool right-click anywhere on the chart, press "Arrow" button located next to line buttons or expand "Tools" in the main chart window and select "Pointer" from the dropdown menu. The line can be changed from one type to another by right-clicking the line and selecting "Type" from the dropdown menu. Possible line types are: extended, ray, reverse ray and segment. The line color can be changed by right-clicking the line and selecting "Color" from the dropdown menu. The line cloning feature creates a line that is parallel to the line being copied. In logarithmic scale environment the line being cloned retains its linear parallel properties to the line being copied. This feature allows for creation of unlimited number of lines that are parallel to each other in linear scale where the chart scale is logarithmic. To make a parallel clone of a line right-click the line and select "Clone" from the dropdown menu. To move a line double left-click on the line an drag it to desired location. The line copy and line move actions can be canceled by right-clicking while dragging the line. Line swivel is a feature where one end of the line is firmly in its place and the other end is being dragged to a new location. Existing line can be swiveled either by double left-clicking the end of the line and dragging it or by right-clicking the line and selecting "Left Swivel" or "Right Swivel" from the dropdown menu. Line Magnet feature allows for exact line ends placements when in the vicinity of a price bar. Placing the first line point on the top or bottom end of the stock price bar will automatically adjust the line end placement to the exact location of the price bar's top or bottom. Line Magnet feature aids in the exact placement of the second line end in the same way. Exact line end placement is confirmed by a visibly larger square around the line end being placed. To see if a line has exact placement points click the line to select it and locate the line ends which are marked with small squares around them. Line ends with perfect placements will have yellow squares around them. To remove all lines from the chart right-click the chart and select "Clear All Lines" from the dropdown menu. You can also select the eraser button located in the main control window. When an overlay study is selected a study settings dialog window will appear. Settings window allows you to change line colors, thickness and study parameters. To accept default setting select OK and the selected study will be plotted on top of the price bars. Detailed descriptions of most overlays can be found in the Stock Technical Indicators section. When a technical indicator is selected a study settings dialog window will appear. Settings window allows you to change line colors, thickness and study parameters. To accept default setting select OK and the selected study will be plotted below the main price bar pane. Detailed descriptions of most technical indicators can be found in the Stock Technical Indicators section. To edit study parameters or study line properties expand "Studies" in the main control window and select "Edit" from the dropdown menu. From the dropdown of all active studies select the study that you want to edit. You can edit study's line properties for all technical indicators and overlays, additionally you can edit specific study parameters changing the way the study lines are calculated. You can also access study edit menu by right-clicking anywhere on the chart and selecting "Edit" from the dropdown menu. 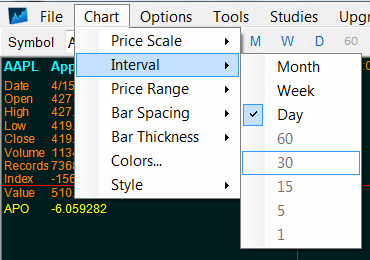 To remove a technical indicator of a price overlay from the chart expand "Studies" in the main control window and select "Remove" from the dropdown menu. From the dropdown of all active studies select the study that you want to remove. You can also remove a study by right-clicking anywhere on the chart and selecting "Remove" from the dropdown menu. Whenever you open a new chart the new chart window opens inside the main control window. You can detach any chart window from its control window by expanding "Window" and selecting "Detach" from the dropdown menu. You can also do that by right-clicking anywhere on the chart and selecting "Detach" from the dropdown. Detached windows can be attached back inside the main control window in a similar manner by selecting "Attach" from the dropdown menu.